The funeral for launderette killer Freddie McClenaghan is expected to take place in Magherafelt on Wednesday. 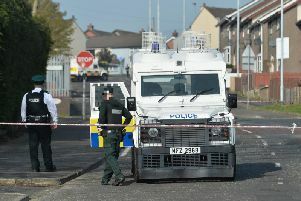 McClenaghan, who murdered his ex-girlfriend at her workplace in Portstewart, died at the Royal Victoria Hospital in Belfast on Sunday. The father-of-two was given a 13-year sentence last year after pleading guilty to the murder of Marion Millican at the launderette in March 2011. It is understood the 57-year-old former painter/decorator died of natural causes and had been transferred from Magilligan Prison last week. In an online death notice, his funeral is scheduled to take place in Magherafelt Independent Methodist Church at 2pm with a request for family flowers only. It added: "Thou shalt be missed because thy seat will be empty. 1 Samuel 20 v 18"
Mrs Millican, a 51-year-old mother of four, was shot in the chest at her workplace. She had previously been in a relationship with McClenaghan. At the murder trial, the court heard their relationship was characterised by violence.